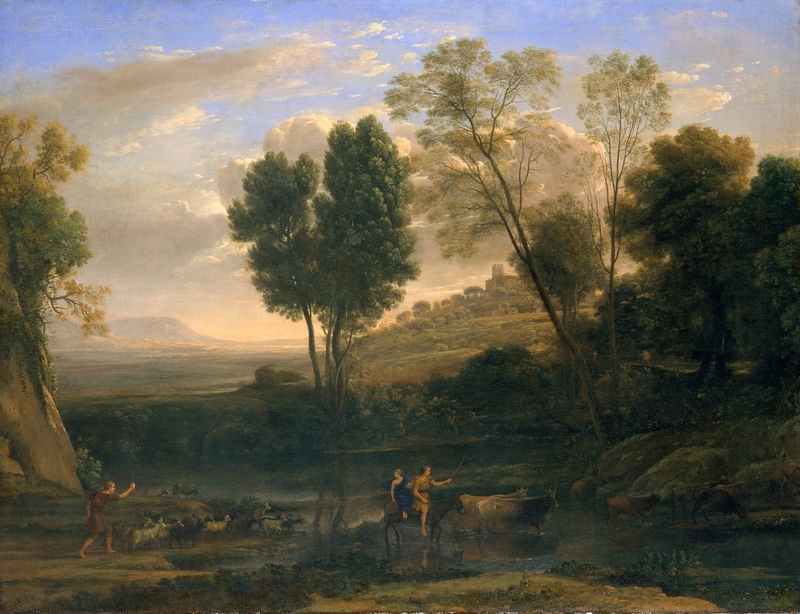 Sunrise (1646–47) by Claude Lorrain located at the Metropolitan Museum of Art, New York. Here we continue the telling of the story of Petrus and Rona. As the sun rose, shimmering across the waves, Petrus began his daily trek up to that large boulder that teeters atop the crag overlooking the valley. Why did he submit himself to this trial every morning? A decade ago, when he had begun to discover the gift of his stamina and strength, he had run for his own prestige. Then he had run for the beauty of a morning sunrise, the singing birds, the memory of a smile on Rona’s face… Of late, he had run to glorify and give thanks to God for all His gifts. Thus, in spite of his loss in strength, what he had given up to keep Rona alive, he still set out each morning. To the amazement of the townsfolk, he ran in both fair weather and foul. Nevertheless, Petrus had run for years, and so few still bothered to notice. Today was different. Here and there his fellow townsfolk stopped their daily chores to take notice. Some with sad faces waved to him. Petrus nodded in return. He supposed people knew how the king had threaten him and Rona. What Petrus did not notice is that many set aside what they were doing and ran after him. Petrus ran on. He used the trail along the northern edge of the crag. That allowed him to look over the sea and down upon the bay that provided the entrance for Teetering Rock’s harbor. Yet as his run continued the trail grew rough, and he grew tired. So he focused on the trail and each stride he took. Eventually Petrus arrived at the huge, teetering boulder. Looking over the sea again, he took a moment to regain his breath and to give thanks for once again for reaching this beautiful spot. Then he strode a few paces more and fell to his knees. He still wondered what to pray. Petrus did not believe he had the strength save both Rona and to satisfy the king. Could the king be satisfied? Wasn’t that his problem? Therefore, he asked God to help him save Rona and for his protection from the king. Oddly, Petrus felt compelled to silence. Even though there was no one who could hear him at this lonely place, for the first time Petrus prayed silently. For the first time Petrus also felt God answering his prayers. There was no voice. He could not explain it, but Petrus knew Rona too was praying, praying for him and refusing his offer of strength. Yet Petrus’ sadness did not become despair. He knew today was Rona’s day to go home. What was home? God did not say. He just knew Rona had fulfilled her life’s purpose. Petrus also knew his second prayer would be answered. Someone capable and righteous would risk everything to stand up to lead his people. Who? That was not his problem. It was time to return to Rona. He rose, turned, and started to run down the hill. Then he saw two men with drawn swords blocking the way, and he stopped. The voice behind him was that of Adolf the goði. Petrus turned back. Adolf stood smiling with a mace in his hand. On either side him stood two lesser priests, each with a mace. The men with swords he had recognized as some of the hoodlums who served the king. The bloodthirsty corruption of the hoodlums did not puzzle him, but these were priests. Then Petrus wondered in bafflement. Lord God, you said we would have your protection? Suddenly stones hailed upon the swordsmen and the priests. Petrus’ five ambushers died before they could use their weapons or run away. Petrus looked behind the dead bodies of the priests. He saw his friends and neighbors stepping from behind the bushes and small trees. He turned again to look at the swordsmen. More of his friends and neighbors stood behind the dead bodies of the swordsmen. In the years since arms had been banned, the men of the town had become very adept at throwing stones with slingshots. Petrus then took off. Dashing to his home to see what had happened to Rona, Petrus then realized he had regained his old strength. Stifling the tears, he lengthen his stride.